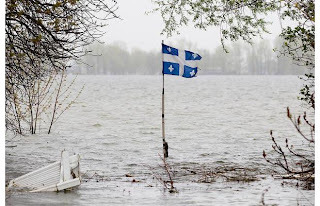 While most Quebecers may cheer the warmer winters, Bourque warns it is already endangering coastlines, the northern communities that are built on permafrost and our forests, which probably will not be able to adapt fast enough to a warmer climate. He said warmer temperatures for pretty well all seasons indicate Quebec is well on its way to meeting the climate-model predictions that we are fast closing in on the 2C mark many scientists claim is the tipping point that will plunge the globe into catastrophic climate change. The models indicate mean temperatures in the southern half of Quebec will be 2C to 3C higher than normal by 2020. In northern Quebec, the warming will be even higher. And at the present rate of warming as tracked since 1948, we are on track to be well over 4C by 2050 and as high as 7C to 9C by 2080. Montreal temperatures in October, November and December were well above normal. Temperatures for the first two weeks of December were on average 3.8C above normal. Not a single daily maximum fell below zero despite the fact the normal maximum daily for this time of year in Montreal is below freezing, according to Environment Canada. Bourque said the data over the last 62 years indicates climate change is beginning to speed up. What worries him is the effect on ecosystems that cannot adjust fast enough to the new climate. “For fauna it is not too big of a challenge,” he said. Most animals can move quickly into a more optimal climate. He noted, for example, that southern Quebec is seeing a wider variety of birds previously common only to more southerly regions. He said the ability to adjust to a warmer climate is much more difficult for plants. The optimal climate envelope in which maple trees can thrive has been steadily moving north and by 2050 will be 500 kilometres north of the townships, he said. “So if you do the calculation this makes 100 km for 10 years which means 10 km per year,” he said. To keep up with its climate envelope, maple trees would have to move about 27 meters a day. In other words, Bourque said, they’d have to start walking. Climate change is happening too quickly for trees and other flora to go through the natural regeneration process fast enough to keep up with their moving climate envelope, he said. “Let’s say the maple is absolutely unable to move northward. Then in 2050 the current maples are going to be in an area where it is not optimal with the climate. It depends on the resistance of the different trees, but it is pretty clear that it is not going to be optimal. So the future for trees looks worrisome. “It is likely that it is going to be negative, very negative (for flora),” he added. “Globally on the planet experts agree that it is going to be negative especially because of the rate of climate change. It is just happening too quickly. Heavy winter storms have been eroding the coastline east of Quebec City, he said. “When you got to Sept Îles, Rimouski, Percé, there is almost on a weekly basis major media articles and all kind of problems of people losing their houses, people having to be moved in crisis situations because of storms,” he said. Rising sea levels play a part, but the main cause is the loss of sea ice, he said. He added a lot of land has been lost in a sector about 15 kilometres east of the city and also in a residential area about 25 kilometres west of the city. A Sept Îles native, he predicts the way things are going he will have to move his home within the next eight years. The damage is already costing taxpayers. The province has a new program to pay homeowners forced to move away from the coast compensation of up to $150,000. “It may sound like a lot but you can’t build a new home in Sept Îles for that money,” Levesque said. In northern communities such as Salluit, permafrost has become an issue of survival. Salluit is a community of 1,500 people and its population is expanding. It is located in a river valley of ice and mud on the Hudson Strait. Scientists say they cannot relate single events such as this year’s record flooding in the Richelieu Valley to climate change. But the heavy rains and fast snowmelt in Vermont that caused the early spring flooding is becoming more frequent. The Richelieu flood cost governments at least $22.3 million in emergency costs and home repairs. That does not includes the costs many homeowners were forced to bear themselves. A study released in November by the National Round Table on Environment and the Economy, called Paying the Price: The Economic Costs of Climate Change for Canada, warns that annual costs could rise to $43 billion by the 2050s. “Where costs are estimated at $43 billion in the high climate change – rapid growth scenario, there is a five per cent chance that the costs could be at least $91 billion per year,” the study states. This entry was posted in Climate Change and tagged Quebec. Bookmark the permalink.